Quite often, I am called to “fix” the mistakes of other process servers in Tempe, Arizona. Most of these “fixes” are for the so-called discount Arizona process servers out there. I’m not going to name any names, but if the agency states “WE WILL NOT BE UNDERSOLD”, what that really means they will quote you 1 price, but if someone else has quoted another price, then they will match. BE CAREFUL, some of the pitfalls to this arrangement are that whatever previous commitments you might have had are now out the window with this “new adjusted price”. 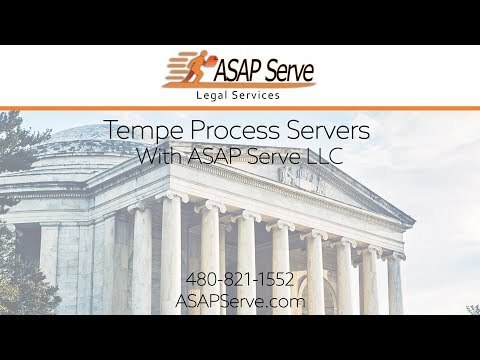 Just this week, I served (on the first attempt) a summons and complaint to a husband and wife that another Process Serving company in Tempe had been assigned. I was made aware of this by the client and went out to serve. Served both individuals, they were very pleasant, and were expecting the papers and wanted to deal with the issue at hand. The former Process Serving Company had returned an Affidavit of Due Diligence, listing 3 attempts made. I asked the defendants whom I had served (and showed them the affidavit) and they were very surprised to say the least, because they were home at the dates and times listed on the affidavit. They were retired and almost always home. ASK ME ABOUT THE REMEDY I SUGGESTED TO THE CLIENT! On another occasion about a month ago, I needed to serve a company a summons and complaint because of an improper Proof of Service generated by yet another “discount” process server. The client was fortunate because he recognized the issue with the Proof of Service with the other company. What had happened was that the manager was not in and he had left the paperwork with another employee, not a person in charge mandated by the AZ Rules of Civil Procedure. I am writing this while on the road and cannot cite the specific rule, but could if requested. Once again, the client (an attorney’s office) knew enough about civil procedure and did not accept the POS, because their client had intimate knowledge of the company being served and knew the employee served was not a manager or someone in charge. It should have been obvious to the other server, as this person was a lot boy at a used car dealer. So, either the server knew and served anyway, or the server was not aware what constitutes a good serve in this instance. Either way, do you want to do business with a discount server that pays their either uneducated or uncaring servers next to nothing to get such an important job done?